Clash Royale |OT| Should I keep playing when Im full on chests? Sent a request to GAF Royale. Stig is my in game name. Edit: Damn that was quick. Thanks! Yeah.. You should be able to use crowns you earn by playing to open your chest and/or shorten the time they require to open..
Just reached level 3, applying to join Gaf Royale! The wait time is weird, but at least it forces me to not just spend crazy amounts of hours on end at this game. Interested to see where they will eventually go with the system. Maybe their market research showed that most people only spent 3min on their games every 3 hours? So, what's everyone's "go-to" deck so far? I'm still playing around with combos, but I think my current deck is fairly solid overall. Sent a request to GAF Royale, name is DeviousChainsaw. The should really up the number of people allowed per clan though, 50 is kinda small. It's been working pretty solid. I mostly get the Bomb Tower out and play a reactive defense. Usually putting out the Witch for most problems, using the Minions for air support, and use Archers and Musketeer's for anti-air and ranged attacks. My offense consists mostly of launching goblin barrels right when they drop their peeps for their attack so it's hard for them to defend it. Has helped me get out of my funk of being stuck in the mid-low 700s. However I noticed I haven't really been using Mini PEKKA or Giants now though. I'll probably switch those two out with others when I get new cards, but it is hard for me to implement those two when I am in the thick of it. Minion horde - great for defense, will always always lose out on elixir exchange if you use for offense. Everyone uses arrows or a fireball, or even a wizard. Dark Prince - used with Hog Rider so DP can clear away minions or help take down defenses. Also takes out barbarians for an elixir advantage. Love this card. Fireball - always have to have one spell at least. Used to bomb enemy minions that are dropped near the enemy's tower or used on groups of enemies. Very rarely do I target towers. Archers - always use archers in every deck. I lose more when I don't have them in my deck, simple as that. Get unit to support a rush or to defend. Goblins - They do insane damage when given the chance. Like to combo with a baby dragon so dragon tanks tower damage while goblins go to work. Also great for taking out enemy hogs cheaply. I'll take one hammer swing from their hog for a 2 elixir advantage plus counter attack every time. Killing their hog with goblins, then dropping a baby dragon and hog to go with the 3 goblins is my favorite counter-attack. Baby dragon - along with archer, baby dragon is in every deck I use. Great for taking out barbarians for a 4-elixir advantage, supporting a rush (one shots groups of little minions), etc. Can't live without it. Tesla - weakest card in my deck because I'm finding offense > defense at higher levels. It's great for distracting golems, so I keep it in my deck for that reason, but using units to defend is always better than using structures because structures can't start a counter-attack. I might remove Tesla and see how that works out. Just not sure what to replace it with. Maybe a wizard. Lightning spell is pretty insane. Buttloads of damage. I love the game so far but the wait time is crazy! I wish you can get other types of rewards by just playing and beating people. Sent request to Gaf Royale as Nik0mon. This is probably the best mobile game ever made in my opinion. The game design is just so damn solid. The sound effects and just overall polish is great as well. Of course the only downside is the wait times on the chests which are insane but they still let you actually play the game as long as you want. Been playing it today, enjoying it so far. Still trying to get the different strategies, although I won most of my games. 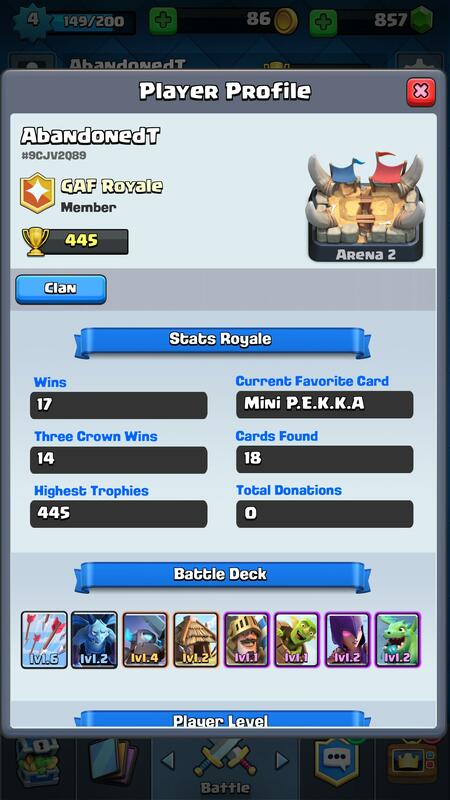 Sent request to join Gaf Royale, as Peleo. Hey guys, just mention your GAF name in your clan entry request, that way you will get accepted quicker and not denied by accident. I've been playing since yesterday and I'm hooked, if only we got rewards when we filled our row of chests though. Game is very fun indeed and incredibly polished, including the balance. It really feels like the Chest system is the only downside of the design. The wait times, the fact that you can only unlock one at a time and that you can't discard any make the entire core of the game feel cheap. It's very common for me to wait 3 hours (for a silver chest to unlock) so I can have a single 3 minutes match. I will continue to play for some time, but if Supercell doesn't change things up I'm sure I'll feel burned out soon. This is pretty fun. Kind of weird the way you only really get rewarded for playing 15 minutes every day, but I'll stick around for a week or two at least. I got a magical chest yesterday which took all night and then some to open, but worth it. Is the match-making matching people with comparable numbers of trophies or comparable tower level? Prince - So glad I drawed the Prince first. Incredible game opener and in general a force. Musketeer - Defense against Flying ppl and second line offense. Kobolds - Cost effextive defense against Giant etc. Fireball - Time saver and good for houses. Valkyrie - Great crowd control. Dunno the english name - the three little flying dragons - They are okay, another flying option. Sent request on gaf royale as well. Just started this a couple days ago. Didnt even know this game existed until it was advertised in CoC. Its fun but i really hate having to wait for chest to unlock. I don't want to up rank with gimped cards. How the hell are people getting prince cards at 150 trophy? I'm almost 300 and i still don't have him. Fun game, I really needed a game I could play in short bursts. Been playing too many games that need heavy grinding lately. I did feel bad when someone rage quit, I was just testing out my new card 'prince' and it trampled all over the other team. Match-making seems to only look at the number of trophies (and which arena you currently rank in). Had a match with someone 2 tower levels above me that also had cards only obtainable from the next arena. Tournament going on right now on twitch. Check in game message. Put in a request to gaf royale, thanks! I haven't found Prince yet and almost everyone I've lost to is using him. That card is nuts. Yeah. If i have Prince in hand at the start of the battle, it usually ends up with a lost tower for my opponent in next few seconds. Then it's like "defend yourself till you have big boys" and usually it's a win. The chest timers really kill the game for me.. It would be a lot better as a game you can actually play. I am far less likely to spend any money due to the current model. Knight + your tower can kill a prince. Throw in an extra cheap unit somewhere if needed. A tombstone completely shuts Prince if you have it. Opening with a Prince is suicide unless you're really lucky that the enemy started with a crap hand. I've been playing since the worldwide launch. Game is a lot of fun. Today has been bad though. Lost like 7 of 9 matches. Yeah, Prince should be only played in a lane when there's mayhem in the other. It's an easy card to shut down with say, a knight right in front of the tower so the opposing Prince won't get the rush damage bonus on your tower. I'm not sure everyone knows how this unit works as I've seen in replays people sitting on a low cost unit that could have shut my Prince down. Good for me I guess. Grabbed a few chests and then got a Magical Chest, meant to try staying awake for my other to unlock and leave that one over night but fell asleep instead, ERGH 12 hours!! Join GAF Royale if you haven't joined a clan yet - think there are still spaces. I just dumped my giant for a dragon as they always seem annoying when the other team uses them. Couldn't see how to join clans, maybe I'm being dumb though? Yeah I was being dumb, it's literally a tab along the bottom! Dumb question, but I climbed to arena 2 pretty quickly without getting a lot of the arena 1 cards from chests. Am I still able to find those cards in chests? Yes, an arena 2 chest will draw cards from the first and second arena pools. Arena 3 chest from arenas 3,2 and 1 pools. And so on. This game is not being kind to my sleep schedule. I turn it on as soon as I get in bed and I know I shouldn't. Just threw £14.99 to the devs for support, happy to do that if I feel a game will hold my attention for a while. Plus with Google rewards, I think about £6 was from free credit. Current deck I'm running seems to work fine. This game is already the top grossing game in the app store. It's crazy how popular it's going to be. Neat game. First mobile game I am enjoying in ages. The wait times, as we all know, are insane though. It's so tempting to just spend 18 gems a piece to open up those silvers and grind a little faster. I know that, for some folks, spending money on free to play games is taboo, but $20 would allow you to open up nearly 140 silver chests, which should last a person weeks of basically playing whenever you want. Yeah this is what I do as well. Two spots open in the "GAF" clan for those interested. I think even dropping $10 early will carry you a long ways. You can immediately trade 500 gems for 10k gold, which will allow you to upgrade your units early, and allow you to get very strong epic cards such as Prince, Baby Dragon, and Witch. You'll still have a lot of gems leftover in case you want more gold or open chests. Also to defend against Prince, just drop cheap units in front of it by your tower so that one of them can absorb the 2x charge attack. After charge is out of the way, he's still a decent unit, but even a mini-Pekka hits harder and has comparable health.